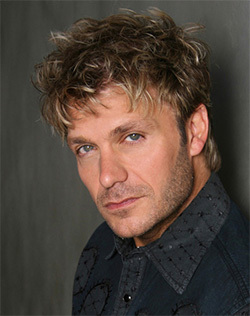 Victor Mignogna is an actor and musician known for his prolific voice-over work in the English dubs of Japanese anime shows, the most notable being Edward Elric from the Fullmetal Alchemist series, for which he earned the American Anime Award for Best Actor in 2007. Other notable anime roles include Broly from the Dragon Ball Z films, Tamaki Suoh in Ouran High School Host Club, Fai D. Flowright in Tsubasa: Reservoir Chronicle, Dark in D.N.Angel, Kurz Weber in the Full Metal Panic! series, Zero and Ichiru Kiryu in the Vampire Knight series, Christopher Aonuma in Digimon Fusion, Nagato in Naruto Shippuden, Ikkaku Madarame in Bleach and Matt Ishida in Digimon Adventure tri.. In video games, he is the voice of E-123 Omega in the Sonic the Hedgehog series and Junpei Iori from Shin Megami Tensei: Persona 3. In live-action work, he has participated in several Star Trek fan productions, including Star Trek Continues where he plays Captain Kirk.